I wonder if you could make an entertaining civilization style game without war - a utopian alternate history in which people cooperate much more often than they fight. Challenges could include natural disasters, global famines, social challenges like poverty and human rights. Maybe an asteroid impact or global warming scenario for the endgame, a final challenge to be overcome by all players, human and AI. Huh. That might be worth playing. Earl J. Woods as he appeared during the burger bus showdown. Some Edmontonians may remember the burger bus, a restaurant on Jasper avenue that served burgers out of a converted double decker bus. I only visited the burger bus a half-dozen times or so, but one such visit still stands out in my memory - the first. - and found myself face to face with a half-dozen surly, brawny, dangerous-looking toughs, sitting around a stained white table, surrounded by a haze of ganja fog. They froze in mid-sentence as I appeared, and a dozen eyes fixed me with tangible, razor-sharp suspicion. One of them wore a black leather vest, a motorcycle cap, and prodigious chainery. 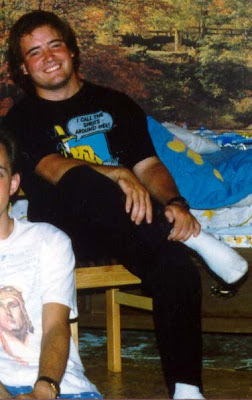 In short, he looked like the biker from the Village People. But this one wasn't singing "The Milk Shake." As soon as my foot crossed the threshold to their inner sanctum, his snapped into his jacket, right where you might wear a shoulder holster. Was he going for a gun? I honestly don't know. I imagine my eyes bulged somewhat as I said, "Whoops! Sorry," and backed out the way I'd come, pulling the door closed. I left without further incident. I returned to the burger bus for a few more meals, but it wasn't long before the establishment was just another memory. The burger bus - it's not just a night out, it's an adventure. Thanks to Mike's prescient taping (or DVDing, I guess), I have now witnessed my first celebrity roast, that of William Shatner. Boy, comedians these days sure use a lot of swear words, but I have to admit - I laughed all the way through. I watched it a second time with Sylvia, and she really enjoyed it too. There's a certain kind of humour that just makes you shake your head and say, "Oh my gosh, did he just actually say that?" Poor Farrah Fawcett looked hooped up on goofballs, poor woman. But what really made the show for me was the montage of Shatner's singing career, including some footage of a music video he made for his version of Mr. Tambourine Man. I hadn't realized that there was a video to go along with the song, and it's awesome, in the full sense of the word: as the song swells to its inevitable crescendo, Shatner is huddled in a dark corner, eyes darting about wildly. "Mr. Tambourine Man?" he whispers plaintively, once, twice, a third time, and then, grimacing like a madman, he shrieks "MISTER TAMBOURINE MAN!" at the top of his lungs. Hmmm. What would Fredric Wertham think of this? What Insipid Butterchurn lacks in raw power, he makes up for in sheer malevolence. Originally recruited by Dr. Verlucci (deceased) on a salvage mission to an abandoned Silly Putty mine, Butterchurn's scathing wit and peerless loyalty to the cause of C.H.A.O.S. made the immobile appliance a favoured son among the Minion crowd. No one has yet discovered what a sentient butterchurn was doing in a Silly Putty mine, but a text made of that pliable material was found next to the sputtering future Minion. 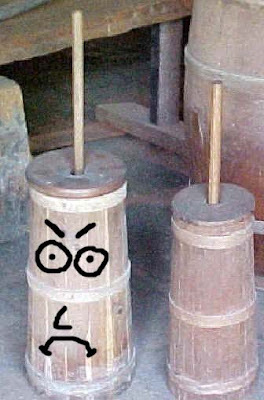 The codex claimed that the churn's existence fulfilled an arcane prophecy, but the exact words are lost to us because Minion agent Carpet Stainer formed the malleable bible into a ball for his own selfish amusement. I'm no scientist, but some of the assertions made in this Space: 1999 comic book confuse me. In panel 2, Dr. Russell says, "The amoebas have to be reduced to atoms...destroyed completely! If any part of the fungus remains, it will regenerate!" Wait, is it an amoeba or a fungus? She's a doctor, shouldn't she know they aren't the same thing? Alan seems to think reducing something to atoms requires an H-bomb. Seems like overkill, but what do I know? Wouldn't lighting the amoeba (or fungus) on fire accomplish the same purpose? But then, "Bergman's computer-like mind finally put(s) the pieces together..." Feed the amoebas heavy water, shoot them with stun guns, and the resulting heat will turn the amoebas (or fungi) into "living H-bombs" (!). 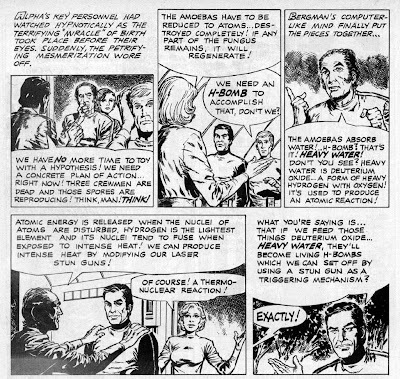 Even if this blathering is scientifically accurate, is setting off a bunch of H-bombs within the corridors of your fragile moonbase really the best plan? As Commander Koenig says: Think, man! Think! How does Batman get himself into these jams? 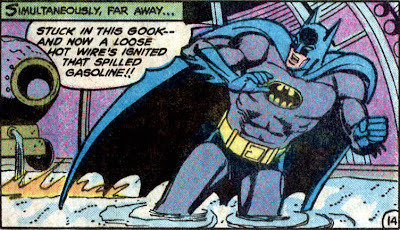 Okay, I can buy the idea that Batman might get stuck in "gook" while fighting crime - but at the same time as someone spills gasoline AND a hot wire comes loose at just the right place to ignite it? Once again, Batman expositizes for the viewing audience, since the artwork doesn't make it completely clear that all this is happening. I wish I had the same talent. When I tripped over the stepladder a few days ago, I didn't have time to cry out, "Tripped over the stepladder! Crashing into the bookcase! Got to hang onto the plate!" Though that would have been cool. "But why was that bow buzzard trying to ventilate YOUR beautiful torso?" What's with the weird emphasis? 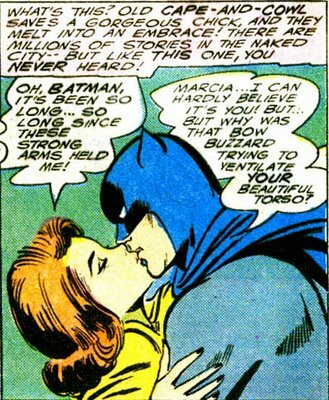 Should the bow buzzard (presumably Batman is referring to a super-villain with an archery motif, maybe Merlyn) be skewering other beautiful torsos? By the way, "There are millions of stories in the naked city" alludes to the seminal 1948 film noir The Naked City, set in Manhattan, the real-world city upon which Batman's Gotham City is based. The actual quote, wryly delivered by the film's narrator at its conclusion, is "There are eight million stories in the naked city; this has been one of them." This is relevant because Criterion, my favourite DVD studio (well, maybe next to Warner Brothers) is releasing the film in a special edition very soon. The film has been on my must-see list for quite some time, and I'm looking forward to picking it up, assuming I can scrape together some extra moolah/green stuff/bread. While visiting Allan's MySpace page, I noticed that he had a "celebrity lookalike" photo collage posted. I thought I'd give it a try myself. Nearly half as good-looking as Alexis Denisof (from Angel, one of my favourite TV shows)- not bad. Yeesh. Is the photo that effeminate - even with the five 'o clock shadow? But...a balloon arrow? A BOOMERANG ARROW? Yeah, that's what I want - an arrow that will turn around and impale me instead of the bad guy. And why oh why is Green Arrow carrying around a fountain pen arrow? Are his skills so incredible that he can actually shoot this arrow and cause it to write something legible on the the target? Not only that, but why a fountain pen? He'd have to pause and dip it in an inkwell before firing. Wouldn't a ballpoint pen arrow make more sense? I can only think of one possible dramatic use for this arrow: upon his induction into the Justice League, Superman must have said, "Welcome to the JLA, GREEN ARROW! To make your membership official, you must sign the OATH OF FEALTY!" To which Green Arrow would have replied, "That's a cinch, SUPERMAN! 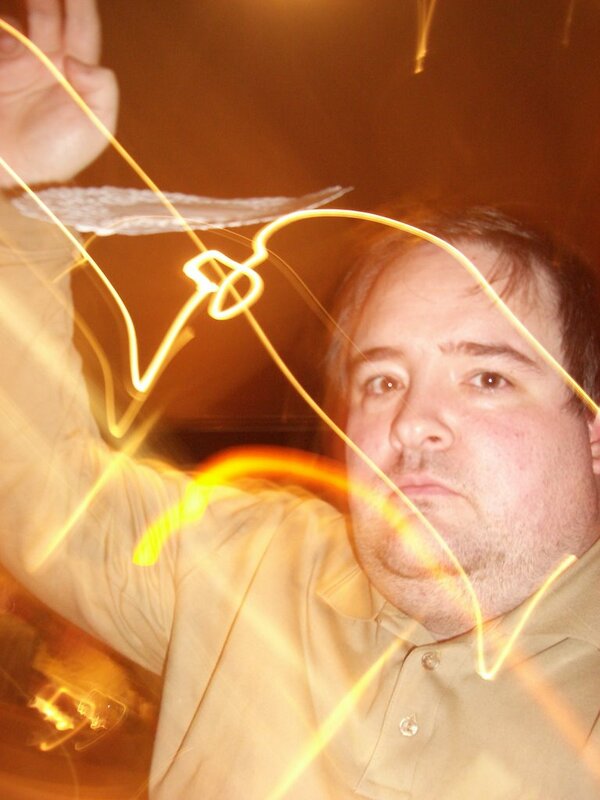 With my trusty FOUNTAIN PEN ARROW, I can sign the document with just the flick of my bowstring!" 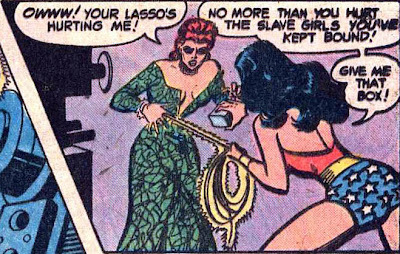 Naturally, these words would have gushed forth in the instant it took Green Arrow to loose the arrow in question. "Holy John Hancock!" Flash would say. Sgt. Rock, DC's long running war comics character, is respected as one of the icons of the medium. Robert Kanigher wrote Rock's adventures for many years, and many of those stories stand out as effective visions of the horrors of war. Of course, not every adventure was award-winning. A member of Rock's Easy Company suffers an undignified assault. 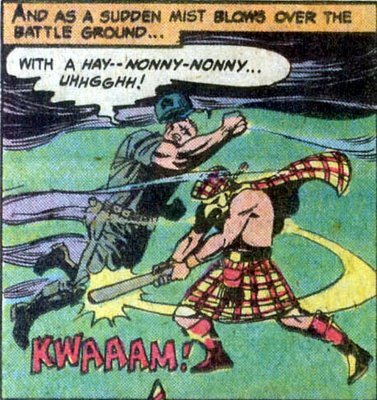 Just goes to show you - if you charge into battle while behaving like a goof, you're liable to get your shins barked by a guy wearing a kilt and a bird mask. From the same story, here's another example of improbable dialogue. When a feral dog latches its rabid jaws onto your vulnerable neck, are you really likely to cry descriptively, "My throat!"? If it were me, I'd probably manage something like "gargle" or "blearrrrgh" while wetting my pants. "Behold, Eck" was the name of an Outer Limits episode. Man, that show had some great titles. "The Forms of Things Unknown," "Keeper of the Purple Twilight," "The Architects of Fear," "Demon With a Glass Hand." I love, love, love a good title. A good title immediately sets the imagination in motion. Who are the architects of fear? Why would a demon have a glass hand? What are the forms of things unknown? Who is the keeper of the purple twilight. What is a purple twilight? Who the heck is Eck? Best title I ever came up with was "Cranium Collision." Ah well. Anyone who's seen my office knows that I work in a tiny labyrinth of bookshelves. This leaves me with limited room to move about, and so today the inevitable happened: I tripped over my stepladder and fell headlong against one of my shelves as well as across a pile of miscellaneous junk. The incident made quite a crash, and I think I may have cried out "Holy crap!" Sylvia thought I'd finally toppled one of my bookshelves - they're stacked pretty precariously. Fortunately, the structural integrity of the shelves held, and I wasn't buried under an avalanche of books. I escaped with a few cuts and bruises, mostly to my right leg - three oozing flesh wounds. Nice bruise on my left shoulder, too. Naturally I started laughing uncontrollably almost as soon as I was able to pick myself up. Had a good giggle for a half-hour or so, in between "ouch"es and "yow"s. Wish I had the incident on video!